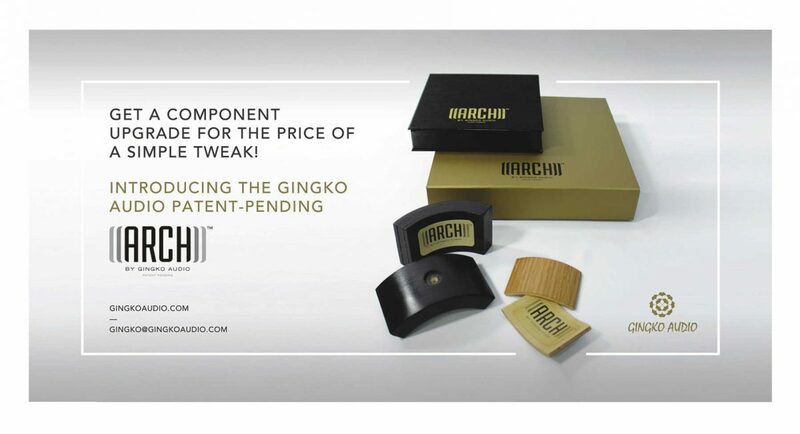 Gingko Audio and Danacable will be in Room 1520 and Booth 8316 at AXPONA from April 12 through April 14, 2019. For a preview of what will be demonstrated, check out this article by Howard Kneller at Sound Stage! Global. Gingko Audio will premiere the Clarissa LE monitor speakers in Room 1520. 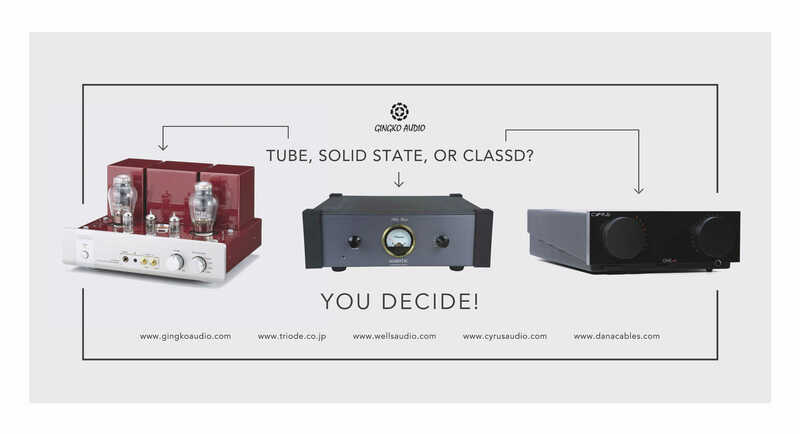 We will drive them using three different integrated amplifiers: A 100W Class D Cyrus One HD from the UK, an 8W tube TRV-A300XR from Triode Corp of Japan, and a 150W solid state Majestic from Wells Audio in California. An international lineup of digital and analog sources from Poland, Austria, Mexico, and the USA is also presented. Cables are from Danacable, racks are from Pangea, and vibration control devices are from Gingko Audio. We plan to run demos every half hour and the audience gets to listen to all three systems – tube, solid state and Class D – playing the same music tracks for a direct comparison. Special Show Sales Promotion! Get 15% off retail with coupon codes given out at the show! See you at AXPONA! 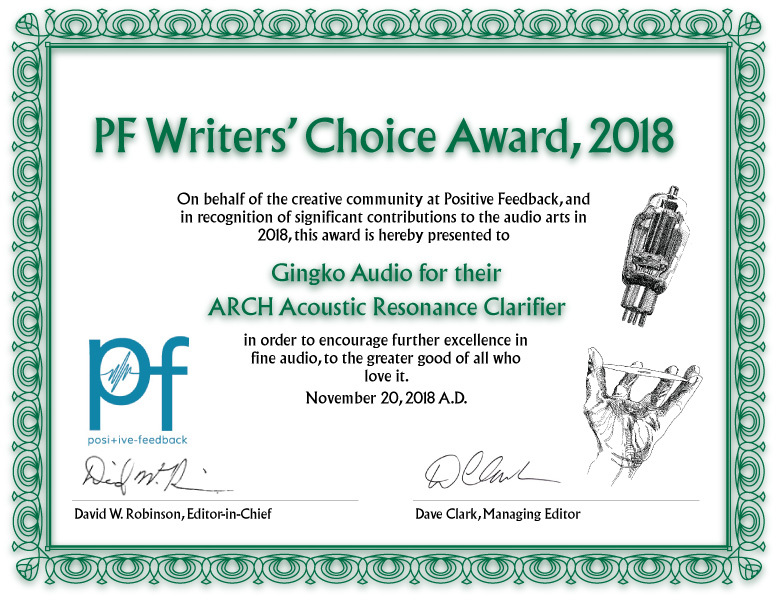 Gingko Audio’s Acoustic Resolution Clarifier (ARCH) won a 2018 Positive Feedback Writers’ Choice Award. These awards are given by the editors and writers of Positive Feedback to products that they evaluated in 2018 and selected for superior audio design. The article on this year’s winners can be found in Issue 100 of Positive Feedback. "I was not prepared for the overall improvement the ARCHs made. Compared to the sound of the speakers and stands sitting on spikes, the improvement to overall transparency and clarity was immediately obvious. The mid-range was less colored, and imaging was better defined. Mid-bass response was enhanced and leading-edge transients were more pronounced. More energetic momentum and timing with a nice ease of flow and a silkiness urged me to get up and dance—and I’m not a dancer. The changes were not subtle, and truly enhanced the listening experience." I must admit I was a little skeptical, but in a A/B test with and without the Cloud under my turntable and with a second set of ears for another opinion, the difference was very noticeable, instantly. We found improvement in clarity and separation of instruments and vocals in the music. There was less mush in between the highs mids and lows. Simply put, it made the music better in every regard. The cloud is a wonderful upgrade to my system and highly recommended. 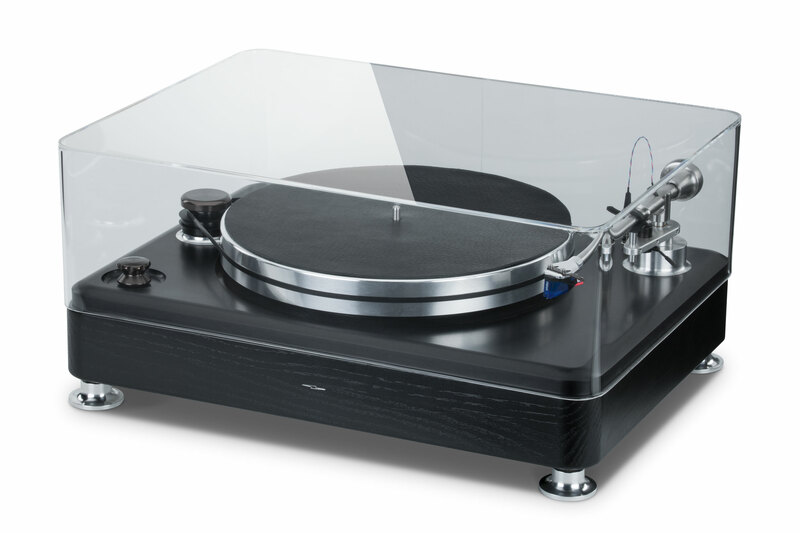 If you’ve lusted for the sound of a suspended turntable, but can’t afford the lofty prices most of them command, consider adding a Cloud platform to what you have now. Gingko Audio is proud to unveil the ARCH Platform at the 2017 Capital Audiofest. Made of acrylic, the ARCH Platform consists of a top plate that rests over a number of Mini-ARCHs placed on a bottom plate. The standard-size platform (18x14x1 inches) retails for $499 and comes with 6 Mini-ARCHs. Up to 21 Mini-ARCHs may be used to support a maximum load of 100 lbs. The ARCH Platform is an attractive and low-maintenance vibration control solution that is tunable to suit your listening taste. 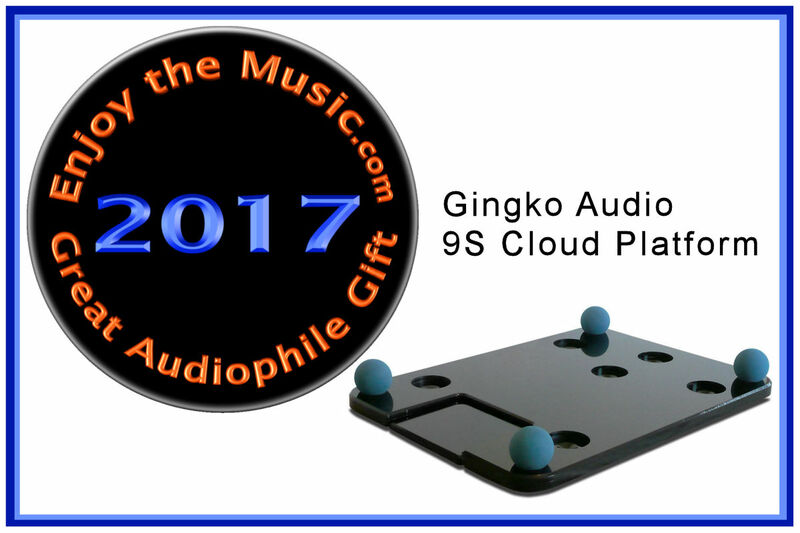 As with all Gingko Audio products, it comes with a 30-day money back guarantee (you pay shipping). Gingko Audio will be at the Rocky Mountain Audiofest in October and the Capitol Audiofest in November. We plan to feature the same demo of the ARCH™ vibration control device that we featured at AXPONA 2017. For an explanation of the vibration measurements used to compare the ARCH’s performance vs. conventional speaker spikes, read our White Paper on why the ARCH works better! 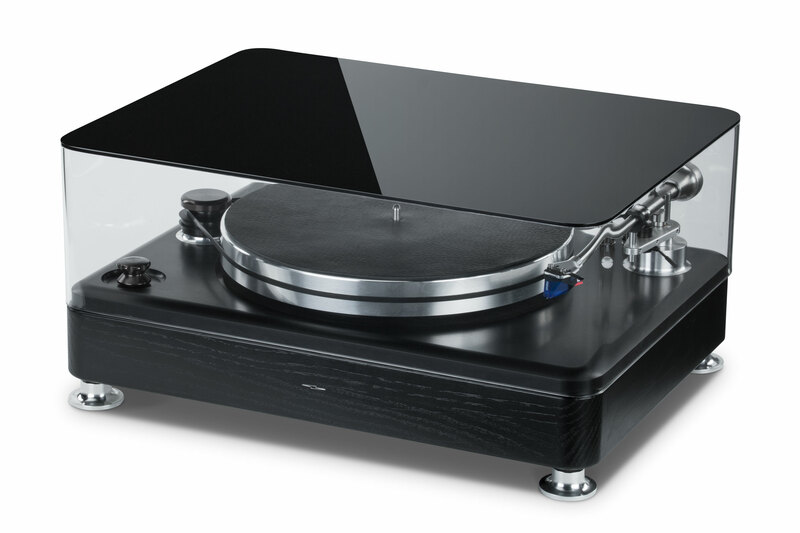 Gingko Audio makes the best looking plinthtop dust cover for the new Shinola Runwell turntable, available with a black top (SH1-B, $399) or a clear top (SH1-C, $399). We unveiled the new patent-pending ARCH Acoustic Resonance Clarifier™ at AXPONA 2017. 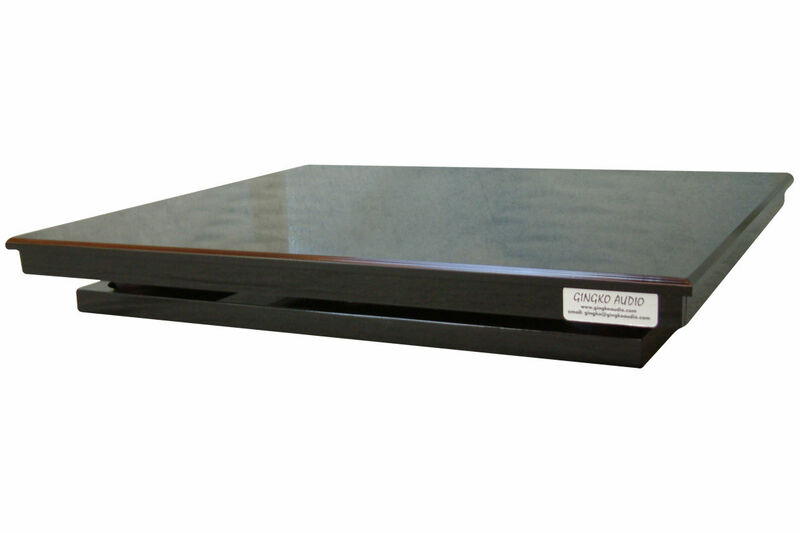 The unique shape of the patent-pending ARCH and its material construction make it an effective vibration control base for speakers and other audio components. 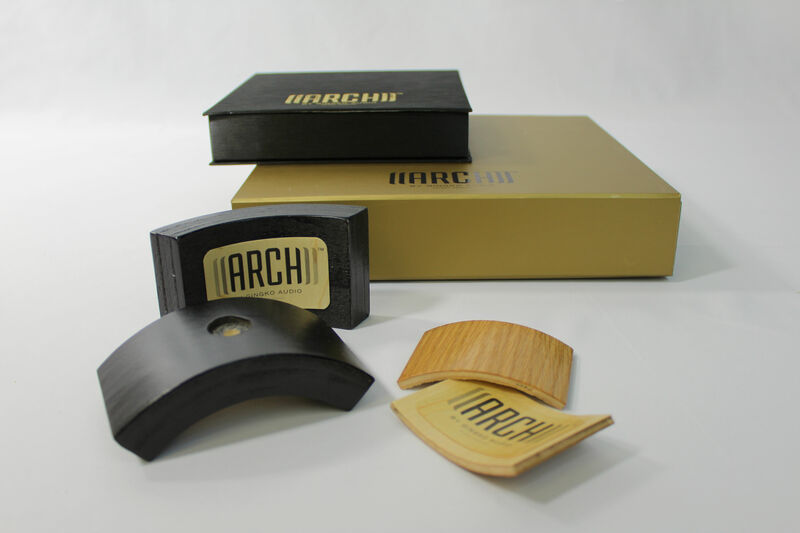 The ARCH is constructed from a lossy material that dissipates vibration across the audio frequency spectrum. Its design is a curved shape with two ends that rest on the floor at an angle, thus minimizing transferred energy from the cabinet to the ground. In addition, the ARCH flexes under the weight of the speaker as the latter vibrates, further reducing the transferred energy. The original ARCH 1 set consists of 8 individual bases, each with a weight bearing limit of 30 lbs. Four ARCH 1 bases can support a speaker weighing a maximum of 120 lbs. For speakers weighing between 120 lbs. and 240 lbs. each, the original ARCH 2 can be put under an ARCH 1 base to hold up to 60 lbs. Each ARCH 2 base can also hold up to 30 lbs. For speakers weighing more than 240 lbs., we offer the original ARCH 3. Each ARCH 3 base can hold up to 100 lbs. 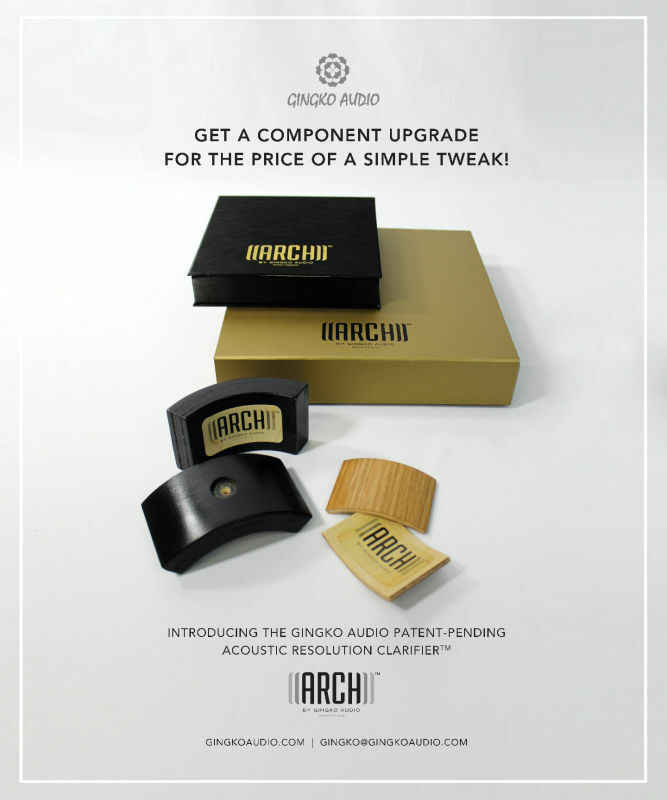 The Mini-ARCH has been improved for use under audio components such as preamps, digital sources, and turntables. Each Mini-ARCH base can support a maximum load of 5 lbs. For heavier components simply stack the Mini-ARCHs to support the weight. The Super-ARCH 1 is a premium ARCH designed primarily for speakers and amplifiers weighing up to 120 lbs. Each Super-ARCH base can support a maximum load of 30 lbs. 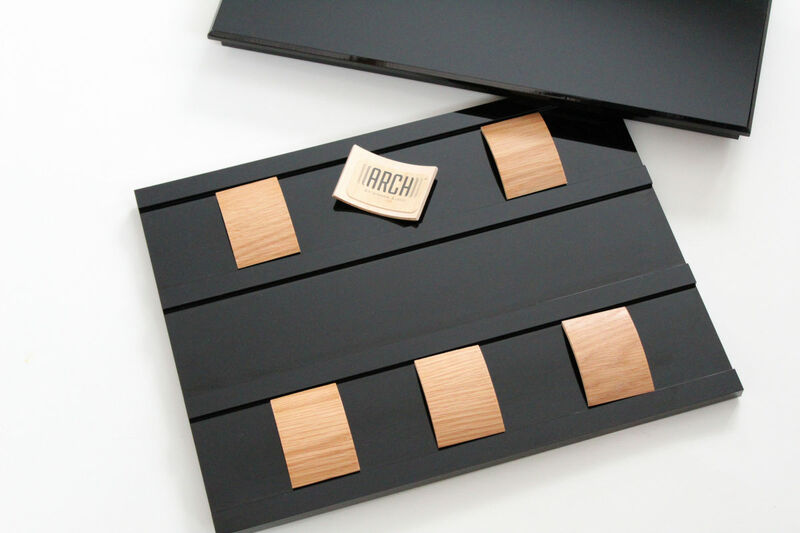 The Super-ARCHs are finished in matte black and sold in sets of 8 pieces. The Mini-ARCHs are sold in sets of 12. "It has long been the mantra of high-end audio that cables are as much an audio component as any other part of your system, and this also applies to headphone cables. More so than any other component, it is the job of the headphone cable to get out of the way and do nothing to the sound, letting the music through and Dana Cables Lazuli Reference Headphone Cables do an exemplary job of this, allowing all the resolution, dynamics and silence to pass through without slowing, congesting, compressing or adding tonal changes to the signal. 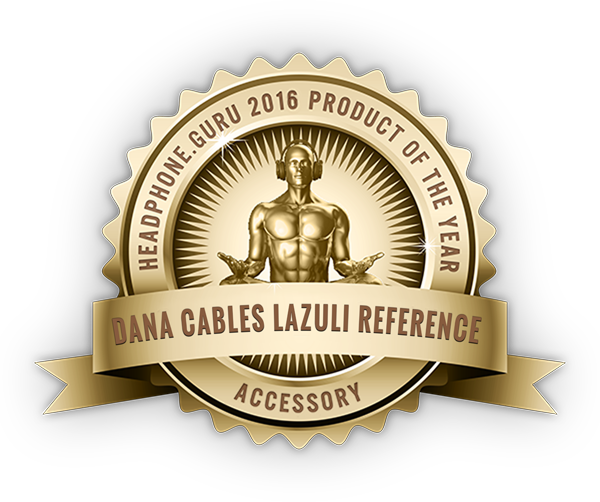 More so than any other headphone, a reference headphone deserves a reference cable which is why we have made Dana Cables Lazuli Reference Headphone Cables our Accessory of the Year." Take a look at the Lazuli Reference and other Danacable™ products at danacables.com. We will again be showing this setup at the NYC Audio Show on November 4-6. Please be sure to stop by to listen if you plan to attend the NYC Audio show. © Gingko Audio, Inc. All rights reserved. Any reproduction of the contents, without permission, is strictly prohibited.